Couldn't get a stream to watch the game today but it sounds like it was one hell of a game. We always seem to have thrillers against Palace and today was no different by the sound of it. Fair play to Milner, that boy will play absolutely anywhere. To put him up against Zaha was a massive challenge for him. This is a massive result for us today. With our defensive injuries we could have been forgiven for drawing today. The right flank of our defence has been decimated and fair play to the lads who are stepping in and doing a job, even if it is not to the standards of their peers. Milner was over stretched today without sufficient cover, in spite of that he did ok.
No if you look it wasn't the kick...yes that was a second or two before Salah goes down...it was Sakho who pulls at Salah's left shoulder. Is there enough for Salah to go down..impossible to say but Sakho pulls at Salah's left shoulder. Look at Salah's left shoulder..not at his feet and you will see the pull. Just on about 4.30 seconds of that footage. At 32.09 hour mark, why there's no penalty? The referee was just about 8 yards away. Lets give that idiotic garth crooks something to bite. he just came out of a cave. Exactly. Saw Zaha go down today like he’s been shot when he wasn’t touched....not a word about that though. The slighest contact and he goes down to the ground looking for a free kick. That's what hey were looking for the whole evening. I was shitting myself before the game and all week and my nerves were warranted but what a comeback from our lads. Finding ways to win with a makeshift defense. Grinding the wins out when not playing well has given me the confidence that when we went 1 behind, I knew we could come back and get 2 to get back in front. I didn't expect the end score though, just glad it was in our favour. It's been a LONG wait. Tbh, there were seasons/times where I was wondering if I'd EVER see us win a title again. 13/14 was a great ride, and we got very close, closest in ages - but it feels different this time, more professional, we're better balanced. This squad has had big disappointments, loosing the CL final, the UEFA Cup. They have the scars - but now have the ammo and the hunger and the dedication to finally pull down big silverware. We keep winning matches, ticking off the games - there's a ways to go, but we're staying ahead. Can't relax, or take anything for granted - Citeh are a worthy contender - but every 3 points, is a game closer to the prize, one I used to almost take for granted in the days when we hoovered up trophies for fun. Would be absolutely gutted to see us let this go - but I don't think we will, this time. I hope not too Brother. I don't know how I will cope after 13-14 Season if we don't win the Title. Not sure I will come back from the shattering, if it does happen. Let's just hope Huddersfield start by doing us a massive favour tonight under the guise of their new Temp Manager. Henderson was a monster yesterday. His passing was excellent! Salah was clinical Keita has a lot of things to learn. We need our defense back to full fitness. Overall, an excellent and vital three points. Well earned break. Imagine 11 days off without a game trying to remove the thought that we dropped points. Yes. Certainly be better competition in the squad. The media has Zaha being offered £44m by Dalian Yifang. That's a shitload of money. I said at the start of the Season that this squad lacked depth and it has showed recently, that is not to take anything away from those who have stepped in when required. Letting Clyne go out on loan was a mistake in my eyes but Klopp must have had his reasons, i trust him implicitly. We had a defence running at 60% output today and still we won. We have won 7 games this Season that in the past we would have drawn or lost. We have eliminated that achilles heel and are looking mentally stronger than in previous Seasons. With injured players to return after the break and players yet to hit form it just makes this achievement so far even more rewarding. If your struggling for a stream next time have a look at the link Shabs put in the stream thread it’s been 100% so far for me the guy done great with that one . We play badly and win a lot, the results have to be more than just luck. There has to be things I'm missing here. Some of it must be related to tactics. Not tictacs by the way. First game at anfield about 1926 I think they said! Just on my way back from Liverpool now - absolutely f**king hanging. What a game to catch live - I was not expecting that at all. It felt like palace had one attack in the first half and f**king scored - was absolutely gutted, and it was a superb f**king goal too. The two goals after half time happened so quickly - it was insane. And it just didn’t stop until the end - I was literally in the stand praying for a winner when it was 2-2. Atmosphere was a bit weird, amazing when we went 2 up, but a bit quiet rest of the game. Loved it though - I’ll take any type of win, was absolutely buzzing and drank half of Liverpool and threw up in the streets this morning as I walked to Lime Street station. Well worth it. Shearer trying to defend himself on Twitter for not condemning Kane's diving, but is that the real point here? I think fans need to speak up for Salah and not let that turnip tarnish Salah's name and our season. 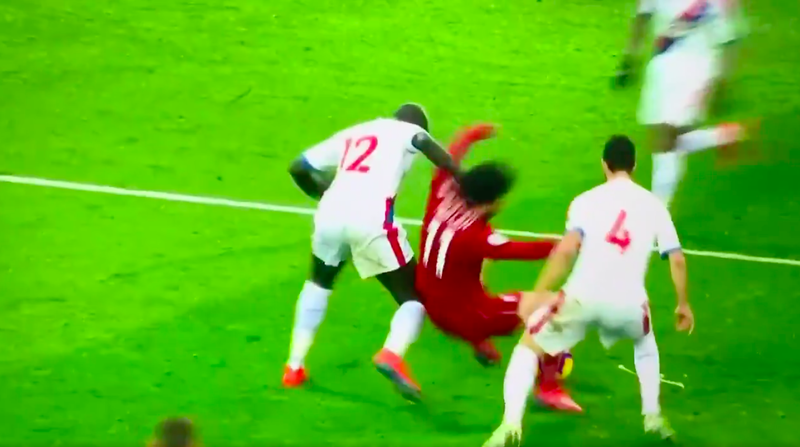 There was contact yes,but it was still a dive from Salah, or certainly there was not enough contact for him to fall over in the way he did, BUT he is not the only one doing it. What I worry about now is that sooner or later we'll get a crucial penalty denied because he has built up a reputation, fairly or unfairly. But you can't accuse Salah of diving as he is a finely balanced player. You/we just do not know how much contact was made a Sakho on Salah's left shoulder. Pulling on the shoulder can easily unbalance a player. It's one of the area's of the body that can easily affect balance. I've tried a few time to say how balance is vital to players like Salah. Can't emphasis how important it is to flair players. It might look like he went down easily...and he might've...but we just don't know. We know he was pulled at when he was on his toes trying to wriggle and feint this way and that. Salah often operated, does his magic on an area no bigger than a manhole cover. Balance can be lost. He often does fall over without being touched. Watch his play closely and you see he loses control of the ball, loses his balance slightly and that happens EVEN when there is NO contact. Better understanding of the type of player Salah is, would help refs and fans understand the dynamics and physics that affect such players. No mention of VVD being held down for their second goal? Their player had hold of him from behind, just long enough so that he couldn't get up for the header. I've watched it a few times now, and Sakho (after the kick) put his hand across his shoulder and dragged him down. Yes, IMO, given the fact that pens showing the same amount of contact have been given by VAR. But the other thing, which is perhaps how irresponsible Shearer and MOTD are. Shearer was a bull of a player, good balance but not a flair player relying on balance and trickery but in calling Salah a diver how much does this type of crap bury itself into the subconscious of watching refs. Could say Salah takes that risk when he does go down easily. We know diving is endemic or not far off it in the game. The main reason VAR was or is being introduced in the first place. Shearer wasn't above "going to ground when he felt the contact" either. In fact if memory serves, he did a fair bit of it. I get the feeling it's a tactic or just Salah deciding he won't ever be caught in a situation like with Ramos in the final last year. I’m disappointed he went to ground so easily - I personally don’t like it. Aside from the annoying Salah thing, again, has to be said...Keita didn't impress, I mean he wasn't dire, he did play Bobby in but he just doesn't turn it on. I wanted him in yesterday. I do like him but the club won't wait.Huge bid has been reported, for Felix. Benfica are talking £100m +. So Nabby might not get another go anytime soon, unless he does something of note when he comes off the bench in the last 20 or so. Disappointed in the lad so far.